Situated on the last few acres of a 140-year old family homestead, Everitt Farms hopes to serve as a platform for a local food district, returning a new Denver suburb to its old agricultural roots. 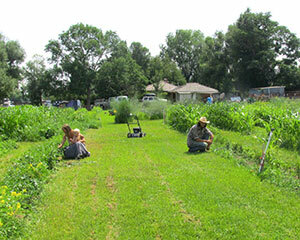 Located in Lakewood, Colorado, the farm is an urban agricultural experiment initiated by husband-and-wife team Derek and Kamise Mullen. The Mullens began the farm just over a year ago on 7.5 continuous acres in the Denver suburbs and another 18 leased acres just down the road. Besides offering local produce, the couple sells Christmas trees, keeps horses and chickens and produce hay on their pasture land. “Our underlying theme is to show how to have a profitable urban farm, a way to get local food to people in a way that makes sense,” says Derek Mullen. A successful Kickstarter campaign in January allowed for the installation of a greenhouse, irrigation system and the rudimentary beginnings of an open air market with farm stand, made of reclaimed barn wood bought with the online funding. Every Saturday over100 families visit Everitt Farms to buy locally grown vegetables and dry goods, according to Derek. Everitt Farms utilizes traditional intensive growing practices, where root vegetables are mixed together in a single trench, growing at different depths in the soil, interspersed with leafy greens surrounding vine crops. “Most people don’t grow in the really intensive ways that we do; we’ve had to go back to the 1800s, before people had space, and try to apply that to our situation,” says Kamise. Despite the challenge of space, the plan for the 7.5-acre urban farm is to act as a catalyst to spark a local food district, offering Lakewood, a town incorporated in 1969, a variety of local products. For the most part, the Mullens have worked alone to develop their concept but hope that as time passes, others will see the potential of a local food district encompassing a bakery, restaurant, butchers and local products grocery store. “We’re still in the planning stages for the businesses we’d like to build but the community is starting to realize when they have extra zucchinis they can come bring it to us and trade it out for tomatoes, jalapenos and things that they couldn’t grow,” says Kamise Mullen. After store fronts are developed, the next project will be creating a 1800s-style bed and breakfast that would offer guests workshops and classes in everything from permaculture to blacksmithing. Some in the community have criticized the Mullens’ development plans as too “pie-in-the-sky.” Educating the local community has become a critical part of Everitt Farms’ sustainable business plans. So Far, Everitt Farms is thriving and growing; the Mullens are paying their bills and feeding their children with enough money left over to continue developing their many projects, says Kamise. One of Everitt Farms’ projects has caught the attention of a number of Colorado agriculture organizations including the Colorado Land Trust, the Jefferson County Conservation District and Great Outdoors Colorado. One parcel of the farm lies on property that once belonged to the family but was sold to a developer back in 2004. After locals protested plans to build an apartment building on the land, the Mullens began leasing the acreage. Derek Mullen hopes to buy back the land and place a conservation easement on it.